Cleddau continued to head upstream on Saturday. 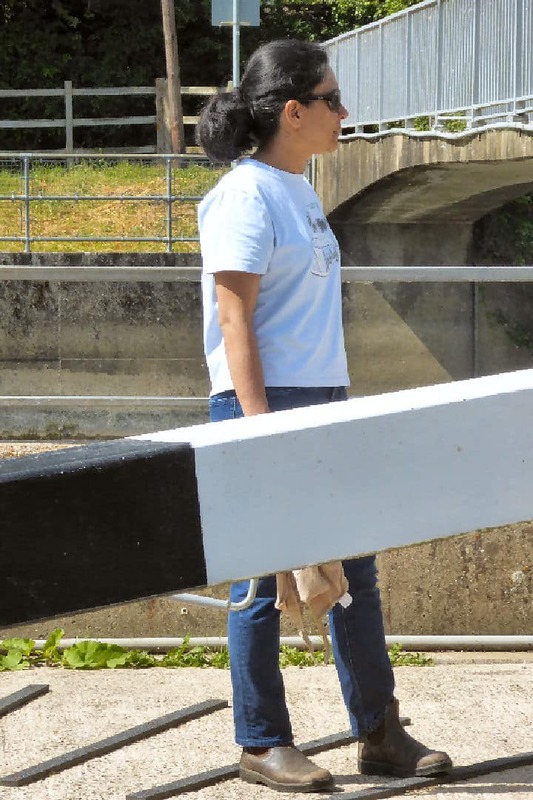 There had been confirmation from boaters at Offord Lock that the water supply in St Neots (non-operational in 2014) was definitely available in 2018. St Neots (a Cambridgeshire market town with a population of over 40,000) was a few miles further on. First though, was Paper Mills Lock. “Nice colours on your boat,” shouted the chap on Bancroft* indicating his own very similar livery. It’s a pleasant run into St Neots from the lock, a boat club on the left, some very good-looking houses on the right. There is a floating pontoon (and tap) at the Priory Centre. While the Captain fed water (very slowly) into the water tank Boatwif was dispatched to town. There is a Waitrose straight ahead and an intriguing mews to the right. Out on the main street crowds of people seemed to be gathered on the square watching something. Watching what? It was St Neots Day of Dance. There was only time for a little watch – then an excuse to return to the shops later for a forgotten item coincided with some feisty skirt swirling of some clog dancers. But it was the Peterborough-based Pig Dyke Molly dancers that intrigued. All were dressed in stark black and white, with all faces painted in combination patterns of black and white. After the clog dancers they took to the square and by contrast seemed remarkably light-footed. With regret Boatwif muttered that she had a boat to catch (does anybody ever believe that?) and made haste to purchase the overlooked washing up liquid before retreating back to the floating life. Onward; out of the lock; under the A428 St Neots-Cambridge road. around Wyboston Lakes which is a leisure complex and business training centre. boats at Kelpie Marine Boat Yard nestled underneath a modern road bridge (the southbound carriageway of the A1) and spread towards the much older bridge which now carries the northbound A1. Away from the trunk road the river seems to narrow, flowing between shelter belts of trees. In the stillness dragonflies and damselflies darted over the water’s surface and enjoyed rest periods on the roof hatch. A swan carried two cygnets on her back, no room it seemed for her other youngsters. Familiar Great Barford came in sight, a few of the 17 arches of its fine stone bridge visible from the lock. moving across once a space became available, an easier boarding place for a Sunday visitation. What’s better than additional crew keen to do the hard work at the locks? Why, it’s additional hard-working crew who bring a sumptuous lunch for all! The Biologist and the Academic (as two of the Three Musketeers) have visited several times before . It was a good round trip, Great Barford to Eaton Socon and back. picnickers and family groups stretched out on the village green, paddle boarders out on the water…. With no other contenders for the Great Barford tap on a sunshiny Monday the Captain proceeded to wash the boat and to polish its roof. a drop in at Danish Camp for coffee and a natter. This had been the venue for the September 2017 Birthdays Cruise . The newest project, an outdoor bar, is nearing completion. “Come and see, “ said Gail. There was talk of the upcoming Bedford River Festival (40 years since it started, likely to be the biggest yet) and then a moving on. into Castle Mill Lock. (The weir is high, the lock is deep, but it’s a calm side-filling chamber). It was Wednesday when in benign conditions Cleddau took up her temporary residence at Priory Marina. 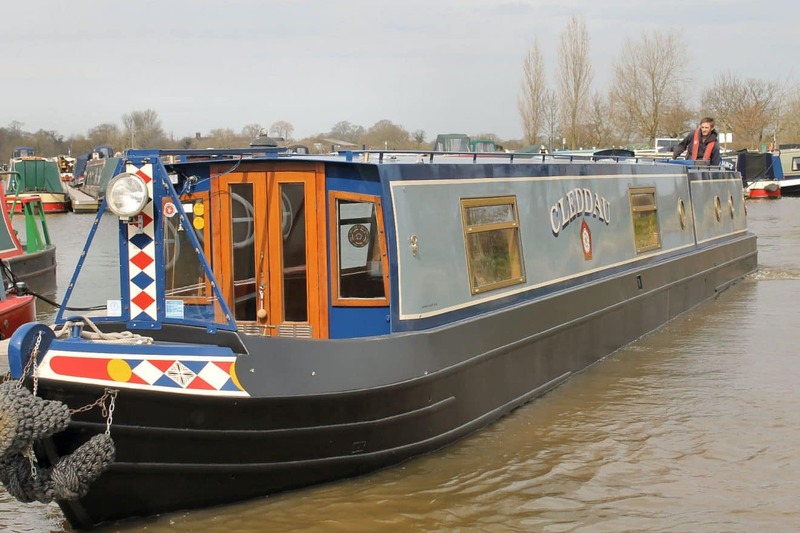 * Enquiries earlier in the week had established that nb Bancroft was so named as its owner had been very involved in the restoration of Bancroft Basin in front of the RSC at Stratford-upon-Avon.